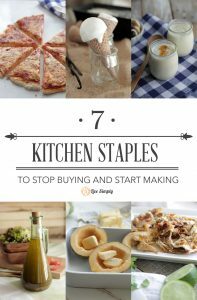 Last week I announced the start of a new series designed to help us prepare food in advance. 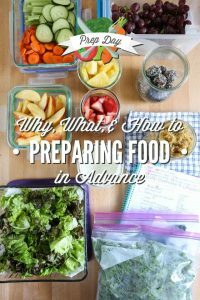 While most of us have the concept of prepping, or at least know this is something we should be doing to make eating real food easier, I believe the actual nitty-gritty practical details of prep day are often overlooked. 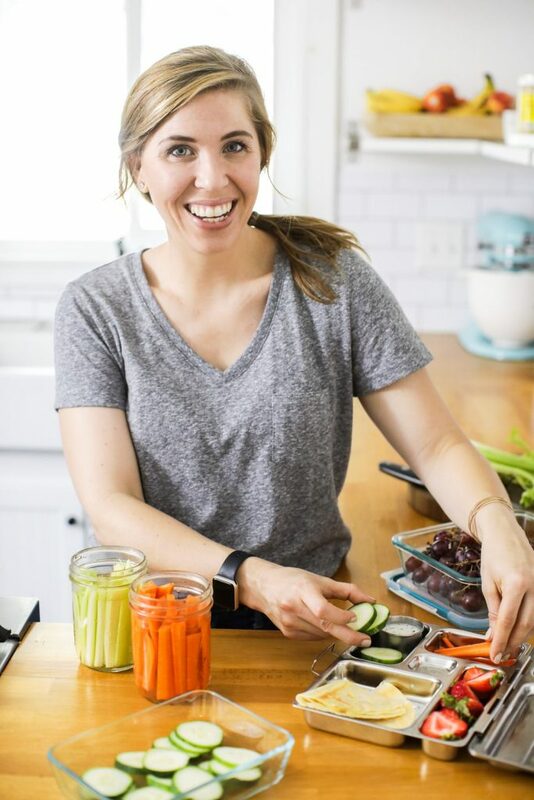 My goal for this series is to help us “sink our teeth” into the practical side of prep time by exploring the “how to” of prepping real food in advance. 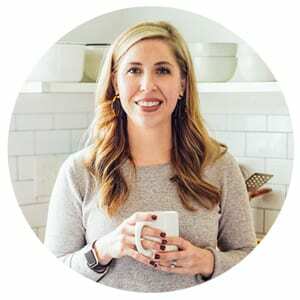 If you’re still curious about the why and what of prepping food, I encourage you to read last week’s post. 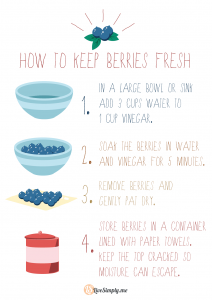 You’ll also find a cool printable to help maximize your prep time in the kitchen. Each week my plan is to keep these posts rather short. I plan to keep my chit-chat to a minimum during this time and focus on the lesson at hand. This week the focus of our prep day lesson is how to prepare leafy greens–lettuce, kale, spinach, chard, etc.–in advance. 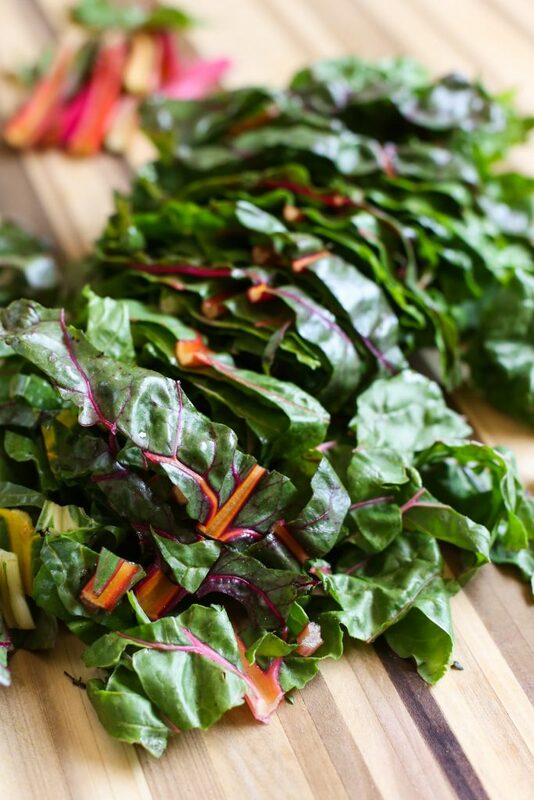 First, let’s focus on the main reasons why you should think about adding leafy greens to your prep time. After all, if you’re going to include a task on your prep day printable or mental plan, it must help maximize your time throughout the week (AKA: it better be important!). 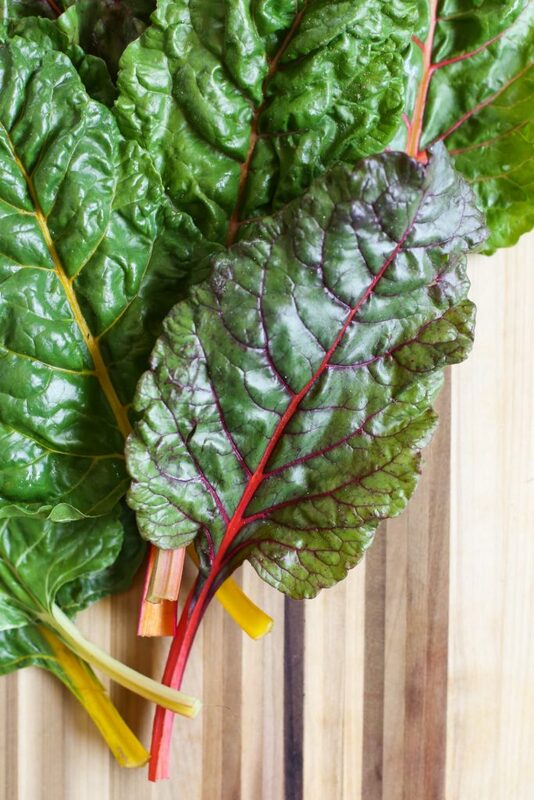 Leafy greens are one of the most delicate foods. I think most of us have experienced the disappointment of purchasing a head of lettuce only to find it rotting in the back of the fridge days later when we actually need to use it for dinner. Not only does this disrupt the dinner plan, it also wastes money and food. Prepping greens in advance ensures greens won’t rot. Raise your hand if you’ve ever purchased greens at the store or market (or maybe pulled them from your garden) with the excitement of using them for the next week’s meals, but life soon gets busy. Busy means you quickly forget or just don’t have time to prepare those gorgeous greens in your fridge. I’m raising my hand. You’re not alone. Prepping greens allows you wash and cut greens in advance so you can always enjoy a salad, sauteed greens, stir-fry, kale chips, etc. No excuses! Prepping greens in advance also encourages your family to take charge of eating “real” throughout the week. There have been many mornings when I simply can’t make Dustin a sandwich for work (something I try to prep in advance, if possible, but it doesn’t always happen). With lettuce chopped and ready to go, Dustin can easily grab a few pieces from the container and make a veggie-packed (and meaty) sandwich on his own. I can also put the kids to work at night prepping a salad because the work which requires supervision–washing and drying greens–is already done! Now for the practical lesson of the day: the “how to” of prepping greens in advance. My method isn’t rocket science, but it works! In fact, my greens will last 7-10 days, depending on the green, in the fridge when prepped in advance using this method. This method works great for bulky greens (kale, romaine, chard, etc.). I don’t recommend washing delicate baby greens in advance. Just wash the baby greens as you need them. 1. 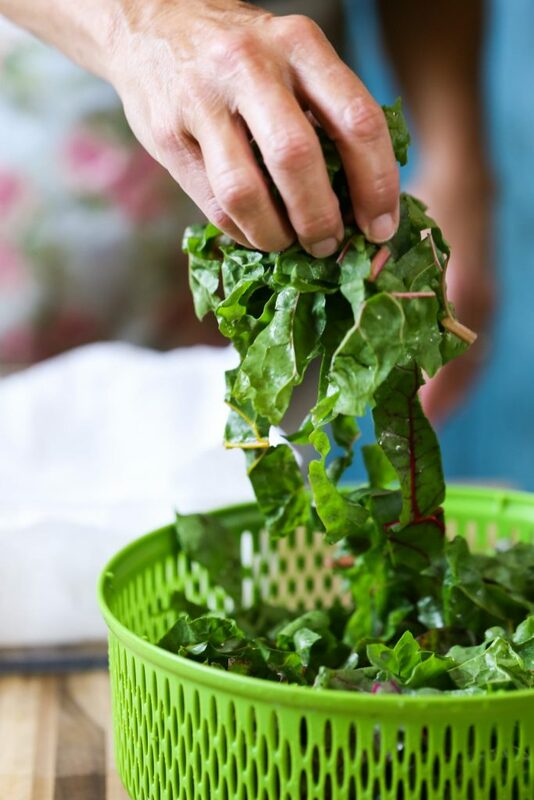 Separate and chop large leafy greens. I’ve found this is particularly helpful for lettuce and large heads of greens (chard, kale, etc.). Of course, as mentioned, this won’t work for baby greens. 2. 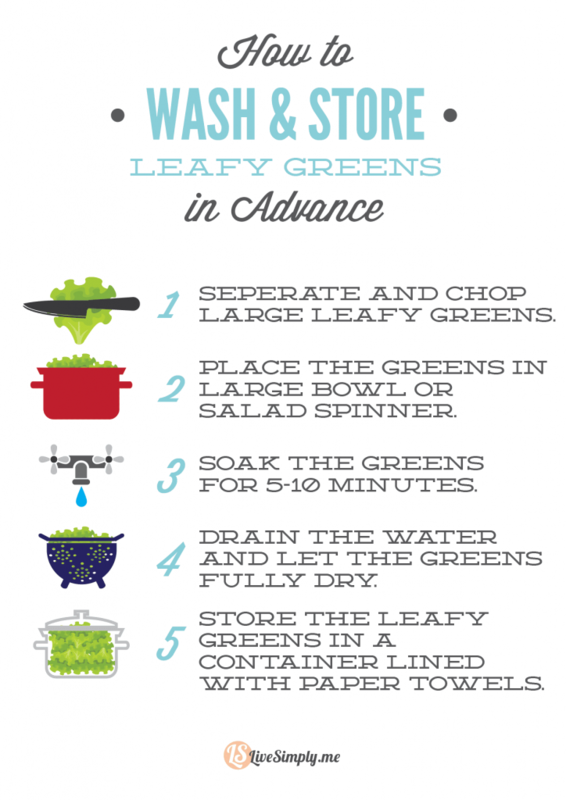 Place the greens in a large bowl or salad spinner base (and the colander part). Fully cover the greens with water. I highly recommend the salad spinner method. This allows you to easily wash and dry greens in very little time. This is the salad spinner I use. A salad spinner is a prep day time-saver and one of the best kitchen investments I’ve made to date. 3. Soak the greens for 5-10 minutes in clean, cold water. One little piece of rotten lettuce can corrupt everything and ruin your fresh greens very quickly, so make sure you also pick out any “bad” greens during this time. 4. Drain the water and let the greens fully dry. 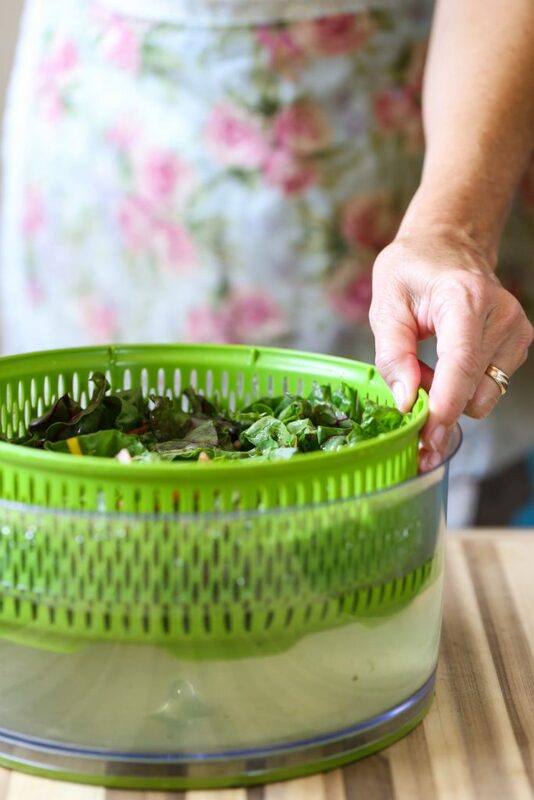 If you’re using a salad spinner base, simply raise the colander part with the greens inside and drain the water from the greens. 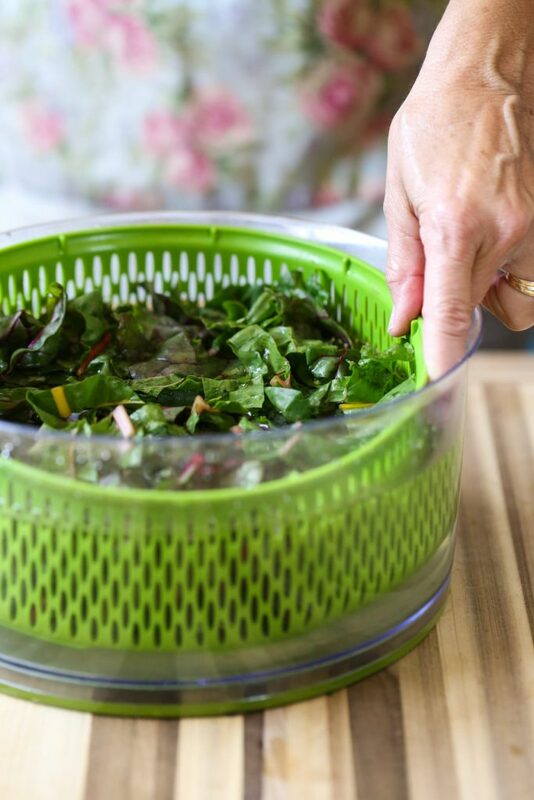 Spin your greens in the salad spinner, and then lay them out in a single layer on a towel if they need more help drying. 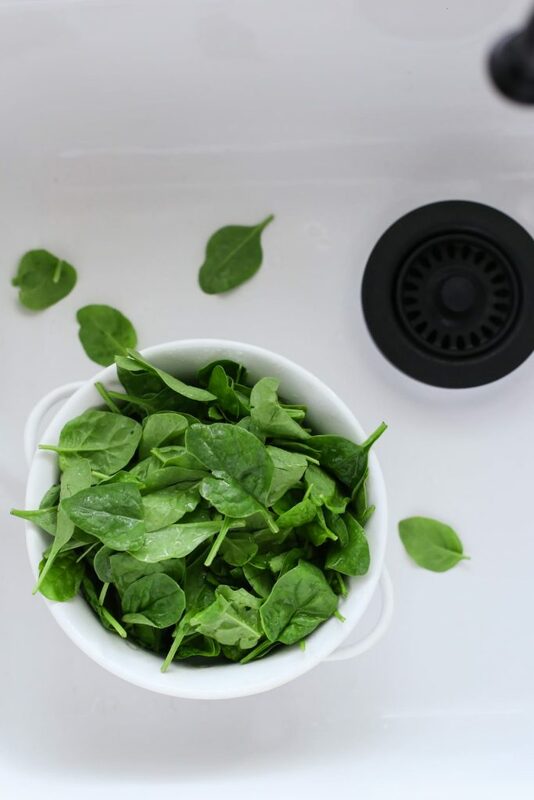 If you don’t have a salad spinner, lay your greens out on a towel to dry (flipping them a few times while they dry to ensure even drying). 5. 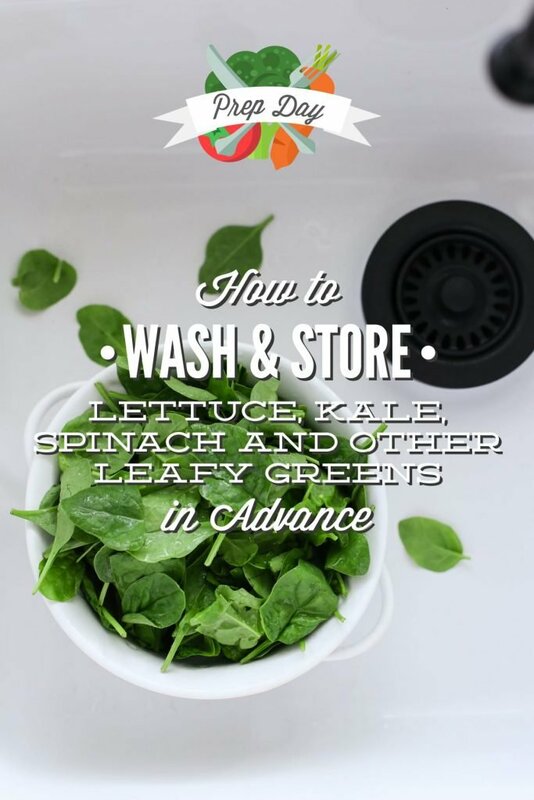 Store the leafy greens in a container lined with paper towels. While large Ziploc bags can be used, I’ve found large containers work best for storing leafy greens. There are two choices for storage: 1. Line the container with one or two paper towels (or unfolded paper napkins) and then place the dry greens over the top. Seal the container and store the greens in the fridge. The container pictured is my favorite for storing leafy greens (find it here). 2. As of 2017, I started using a OXO Produce Keeper for my greens (I have medium boxes). The containers use (natural) charcoal filters and a raised basket to keep the greens fresh (and herbs!). Using the OXO Produce Keeper, my greens will keep in the fridge for two weeks. I don’t use a paper towel base with these containers. I just add my greens and place the top of the box. Seasonal greens will always last longer and taste better. It can be hard when shopping in a conventional store to avoid purchasing greens in plastic boxes, but if you have a choice, go with the loose greens versus the boxed option. Boxed greens tend to rot faster thanks to one or two bad pieces that corrupt the whole bunch. This can be difficult when purchasing some greens like baby spinach. If a box can’t be avoided, follow this same method with the greens even if the box states, “already washed.” Spinach and arugula are my exceptions to this rule. Always look at your greens before making a purchase. Look for super fresh greens; not greens with brown spots and slimy leaves that need to be used ASAP! This may mean digging to the bottom of the “pile” or maybe going with the red leaf lettuce this week versus the butter lettuce. This week, your homework is to create a meal plan, go shopping for the food you’ll need to implement the meal plan, set aside a specific day/time for prep time, and then print and fill out the Prep Day Action Plan printable. Focus on five foods you can prep this week based on your meal plan and schedule: washing and storing greens, making rice, baking muffins, etc. Wow, perfect timing, Kristin! I was just wondering about this, because sometimes we inadvertently let our CSA leafy greens go to waste. I had no idea that soaking was necessary– I’m definitely going to do that next time! Also, what are your thoughts on the crisper drawer? Better to box the prepped greens with paper towels? I’m so glad the post was helpful!! I know the cripser drawer is supposed to be a magical place, but for some reason my veggies wilt really fast in there. Maybe my fridge just isn’t up to par, or I’m not using my settings correctly. We have a new fridge going in with the kitchen remodel, so maybe I’ll give the crisper drawer a try once it’s installed. For now, I’ve found the glass containers work best. 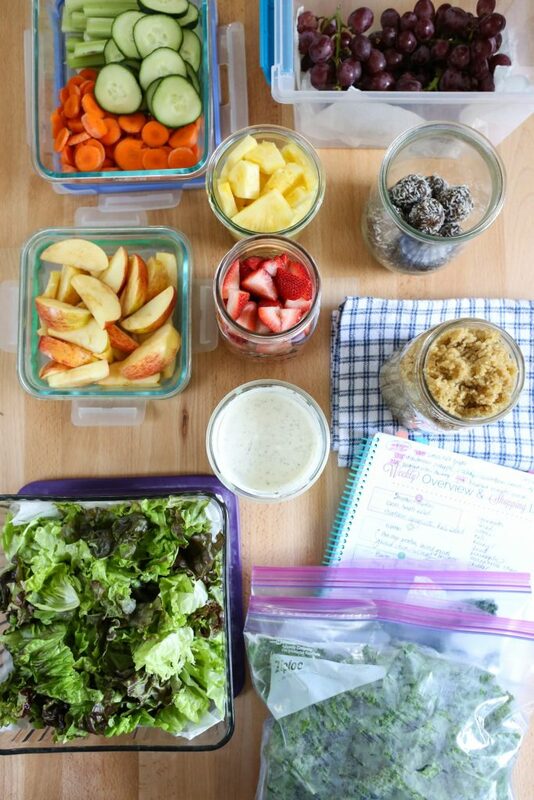 Another tip the correlates with your glass container, i put all my cut and washed lettuce/greens in a mason jar in my fridge, for me it takes up less space than a large container and lasts more than a week!! Great tip, Marlena! Thank you for sharing! It is wonderful how you combine zero waste cooking with additional time to spend with your family! I go for zero waste but I’ve never thought that I can bring family together as well! Thanks for sharing it here! Do I need to wash the greens with your water/lemon/vinegar before beginning this process? Hey Kelly, I personally don’t :). I save vinegar and/or lemon (I just combine the ingredients in the water bath these days versus making a special bottle) for berries, cherries, etc. As I banned paper towels from my kitchen (by replacing them with cloth napkins and small towels) do you think it might be possible to replace the paper towel in the glass container by a kitchen cloth as well? Hey Sabine, I definitely think so! PS: I’m so glad you’re enjoying the blog! Thank you for this. Great advice! Hey Kim, Congrats on the CSA–that’s so exciting! 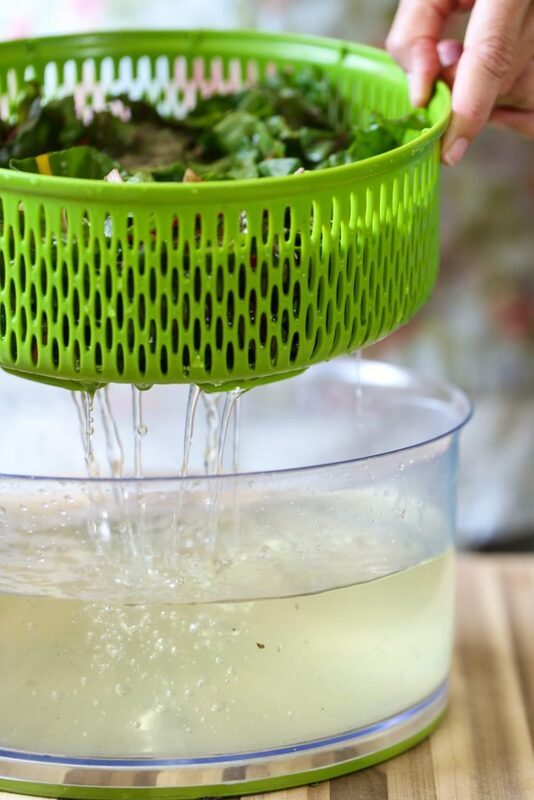 For hearty lettuces, washing is generally okay. For very delicate lettuces, it can be hit or miss. Sometimes local lettuce straight from the farm can vary from very delicate to a bit more hearty, depending on the time of year. Let me know how it goes! Also, I started using OXO Produce Keepers to store my greens and CSA veggies this year, and absolutely love them. They really helped extend the life of my greens. Would there be any major difference if I thoroughly dried the greens & didn’t store them with a lined paper towel? I just try to limit my paper towel usage. Hey Rico, The paper towels just prevents any moisture from ruining the greens as they sit in the fridge. Thank you so much for your post. After I washed/soaked and then let dry my greens seemed to wilt while drying. How do you get yours fully dry so that they don’t wilt in the process? (I don’t have a salad spinner- maybe that’s the problem lol). 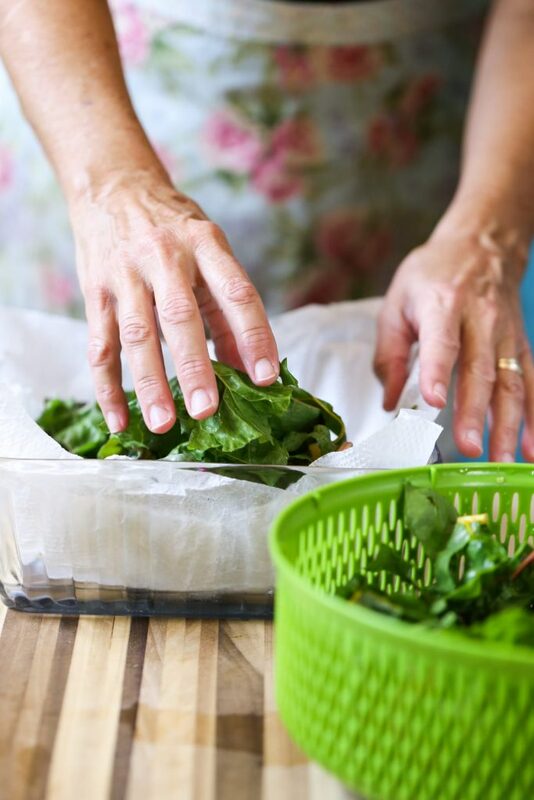 Hey Renee, My best advice for drying without a salad spinner is to lay everything out on a towel in a single layer and flip the leaves every 30 minutes, until dry. You could also try shaking the leaves off a bit before drying. Also, some lettuce varieties are really delicate, so it may be best to skip washing them–just follow the other steps–so they don’t easily wilt during the washing/drying step. Thanks for the quick response! I had laid them on a towel in a single layer, but didn’t flip them so that might help next time! Appreciate it. Hey Renee, Yes, I think the flipping will definitely help. Hi Kristin! I love your blog, and I get new ideas all the time! Thanks for being a source of inspiration! So, no pre washing spinach and arugula? Just change containers? Is that correct? Hey Ticia, I’m so glad you’re enjoying the blog! Yes, I’ve found that’s the best for delicate baby greens, like spinach and arugula. 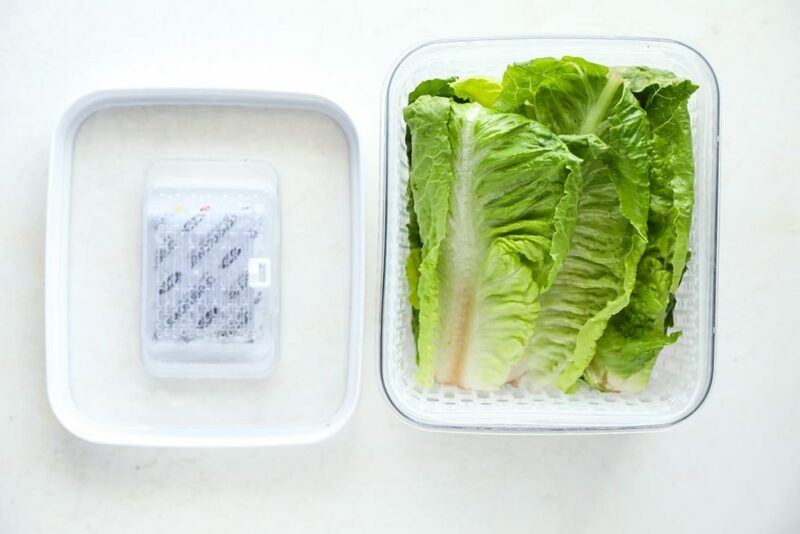 You could also put a papertowel in on top of the greens (using the same container the greens came in), close the lid, and then flip the container over. That’s works, too. Hey Angie, Thank you. You can definitely wash and spin as you need to. I would just pick out any rotting leaves before storing the greens in the fridge. That’s what I do with my market greens now.